The story begins with Abraham’s servant introducing himself and telling his story to Rebekah’s family, in an effort to convince them that Rebekah should marry Isaac. He testifies to all the blessings that Abraham has received from God. 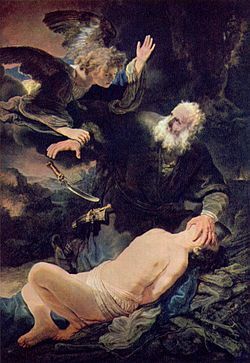 This portrays God as one who has a history of blessing Abraham. The story understands Abraham’s wealth to result from the blessing of God. It emphasizes that God gives success as blessing, but that success is a judgment of one’s faith. The servant asks Laban and Bethuel to give their daughter to become Isaac’s wife. They respond directly. The author concludes the story in a brief and direct way. The servant identifies Isaac as the “master,” an indication of the transition from Abraham to Isaac. The servant’s retelling the story one more time becomes an occasion for setting the next stage of the story. Isaac and Rebekah are married, and what might have been just an arranged marriage grows into a love-story. The veil may be a signal from Rebekah that she accepts Isaac as her husband; her presence in Sarah’s tent signifies her new role as matriarch of this family. This story highlights the theme of divine guidance, especially in the servant’s prayers and in his rehearsal of earlier events. The retelling constitutes a public testimony to the presence and activity of God, to which Laban and Bethuel respond with their own witness. But the servant remains anonymous in the story. Perhaps that is the mark of true service to God. Another piece to this story is the indication that Abraham is determined to ensure that his descendents will not intermarry with the Canaanite people. Isaac’s wife must exhibit the virtues of faith and obedience. This is the reason that the story goes to great lengths to set out Rebekah’s outstanding character. So, this is also a story of Rebekah’s response to God’s call. Rebekah serves as the epitome of God’s servants—strong, compassionate, loving, and faithful. The focus in this story is not so much what anyone gets but what it means to be a loving and faithful servant toward God. Rather than looking at the “and they all lived happily ever after” notion where God is depicted as some sort of divine Santa Claus character that gives good little boys and girls what they want, this is the story of God’s involvement in people’s lives. God is not picking and choosing what will happen in our lives; God is walking with us through life itself. And when our lives intertwine with the God who loves us and whose only desire is that we love God, our lives will indeed be blessed. But blessedness is a much larger meaning than just getting what we want; it’s about becoming who God envisions us to be. It’s about declaring one’s dependence upon God to walk the journey before us. Abraham and Sarah, like all good Jewish parents after them, were getting worried about their son, Isaac. He was already pushing 40 with no good marriage prospects in sight. So they decided to send their trusted servant Eliezer to find them a daughter-in-law from their old hometown. Eliezer travels the distance, and when he approaches the watering hole outside town, he makes the following prayer to the Almighty: “When I approach the well to get a drink, if a young girl shall offer me fresh water from her pitcher, and, without my asking, also offer to draw more water to quench the thirst of all my camels — she is the one who is fitting to marry into the illustrious family of Abraham and Sarah. So, please, God, help me be successful in finding the right girl.” Well, to make a long story short, along comes Rebeccah and offers Eliezer and his camels plenty of water to drink, and she then consents to travel back to Canaan with Eliezer in order to marry Isaac. What an unbelievable story! I mean, would you pick a spouse for a lifetime just because you bumped into her at a bar, and she offered you a drink and even filled up your car with gas??!! Let’s get real! What do you think it means that the servant remains anonymous? How does this story speak to the “Gospel of Success” mentality of today? What does being “blessed” mean then? This appears to be an unusual passage for Paul. The way he develops the thoughts even beyond this reading suggests that he is saying something stronger than just being puzzled by his own behavior. He is referring, instead, to what could be called “sins of ignorance”. It is a paradox of seeing the right thing to do, delighting in it and wanting to perform it, and yet discovering that what is performed is not it. It happens to the best of us! Paul is talking, here, about Israel as a whole. As a nation, Israel delighted in Torah formally and officially, but was always aware when Torah was not followed. Paul goes on, assuming that Torah is not at fault but, rather, those who should be following Torah. The claim that it is no longer “I”, but sin, is interesting. This concept of the indwelling of sin is new. This makes even more explicit the dualistic idea of good vs. evil. The assumption is not that humans are not responsible for their actions (i.e. “sin” made me do it), though. Every human, though, has a sense of a higher good. But what Paul is leading up to is that, of course, we are rescued from this sinful state through Jesus Christ. Essentially, Paul claims that it is a faithful relationship, rather than adherence to the law, that ultimately changes people. I don’t think that he is ignoring or discounting the law; he’s just saying that it’s not the sole measure of one’s relationship with God. Our faith cannot be “proven” by right living; Right living is a product of our faith. This whole passage could be a pretty slippery slope, so to speak, for those who would like to get out of taking responsibility for their actions. Paul is in no way saying that he is not to be blamed for his own actions. Perhaps he is just acknowledging that all of us walk that line between good and evil, between light and shadows, between who we know we should be and who we end up being. It is NOT a “devil made me do it” type of attitude. First century believers had no notion of some outside entity pulling us away from God. It is rather a constant and ongoing struggle to be who we are called to be. You can call it evil; you can call it your “shadow side”; you can call it just “messing up royally”. Whatever it is, it is being less than yourself. It is being less than human. In Jesus Christ, we were shown how to be fully human—compassionate, righteous, forgiving, loving. Anything else is less than ourselves. Every religion has something like this—the Hindus call it good Karma; the Buddhists refer to it as being “one with the Truth”; we Wesleyans call it “going on to perfection”. Interestingly enough, Islam identifies the conflict with the human soul as “jihad”. The Arabic root means to “strive, effort, labor”. Lesser jihad defines the kind of struggle in defense of oneself (i.e. military struggles). But greater jihad is the fighting of evil in one’s own heart. It refers to an inward transformation over one’s ego. I think Paul referred to it as victory over sin and death. Thanks be to God through Jesus Christ our Lord! How do you think this plays out in today’s society? Does everyone have a sense of a higher good? This passage begins by referring to a particular “generation”. The ones to whom Jesus is referring are his contemporaries, probably the well-learned ones of the faith. But, of course, they just don’t get it. The reference to children in the market place probably refers to children not getting along with each other. In Near Eastern customs, this reference is probably referring to gender roles. There was the custom of a round dance accompanied by a flute that was performed at weddings by men. Conversely, the act of mourning was considered “women’s work”. This small parable is used to describe John the Baptist (whose message inaugurating Jesus’ message was riddled with cynicism and judgment) as a funeral dance. Jesus, on the other hand, was compared to the joy of the wedding dance. But, regardless, neither is being accepted by this “generation” who thinks they know best. Jesus then gives thanks to God for “hiding” things from the wise and the intelligent. It is not that God intentionally hides things but, rather, that these so-called “wise and intelligent” ones are too wrapped up in their other thoughts to be open to realizing who and what Jesus is and what his message means. No one can know everything about Jesus, but by being open to the wisdom of Jesus, one will gain the freedom of depending upon Christ. This is perhaps a note of warning to the “religious wise”, those who think that they know everything that God envisions and everything that is God. The ending of this passage, truly one of the veritable favorites of the Bible (St. Paul’s has a whole window around it…but you have to turn around when you’re sitting in the sanctuary or become a clergy! ), is not a calling to worship Jesus as an idol. It is a calling to learn a whole new way of being even in the midst of the perils and pains that may accompany this life. It is not a way of rules and demands; it is the Way of Love and Joy even in this life. It is a release of ourselves that we might rest in the Way that is Christ. True wisdom is gained through repentance, through turning away from ourselves and toward God. It is those burdens that we are being asked to lay down that we might have rest—the burden of ourselves, the burden of trying to hold together a life that is not real, that is not who we are supposed to be. It is declaring the true freedom to which we are called, a way of total oneness and dependence upon God for our very life. In order to answer Jesus’ invitation to participate in his deeds of power and his life of joy, we have to lay down certain burdens that we have mistaken for blessings. I can’t help but think of the time worn anecdote about catching monkeys in the wild. When trying to catch a monkey for the zoo trappers take a small cage out into the jungle. Inside the cage they place a bunch of bananas and then they close it, locking the bananas inside. A monkey coming along and spotting the bananas, will reach through the narrow rungs of the cage and grab a banana. But he can’t get it out. And no matter how hard he tries—twisting his hand back and forth—he can’t pull his hand through the rungs while hanging on to the banana. And even with the approaching trappers he won’t let go of the banana. For the trappers, it’s simply a matter then, of coming up and grabbing the monkey. Jesus instructs would-be disciples to lay down the burden of lesser obligations and get in the boat with him (Mt. 8:18-22). He instructs the Twelve to travel light and to divest themselves of the burden of fear as they go out to spread his message (Mt. 10:5-32). He encourages the religious leaders to lay down the burden of Sabbath healing laws to allow a man with a withered hand to find wholeness (Mt. 12:9-14). To be told we can lay down our burdens sounds so sweet, until we realize that, in Jesus’ eyes, many things we view as blessings are actually burdens. These would include, both in his time and ours, judging others, viewing oneself as occupying a superior position to others and entitled to a more comfortable life with more material possessions, and making a vocation of excluding and avoiding the unclean and the sinner, those on the bottom rung of the social ladder. To those who view those things as their birthright and most cherished possessions, to be required to divest oneself of them sounds like sacrifice. And it is. But it is on the way to a life of being forgiven, being refreshed, and being empowered to live with the humility, discernment, courage, and compassion that is the essence of Wisdom. Wisdom in Person, the real deal, stands before us in Matthew 11:16. His “deeds” include healing, feeding, exorcizing, forgiving, and teaching us the Way. The question is, will we choose to participate in them? Will we allow Wisdom to be vindicated by her deeds as they show up in our lives? How do you think this plays out in our society? What do you think of this idea of God in “hiding”? What is your vision of “rest” as it is depicted here? What “burdens” get in the way of our “blessings”?